After graduating from Cranbrook, Tod received his undergraduate degree and a Master of Fine Arts and Architecture from Princeton. 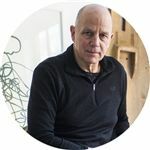 For over thirty years he has been principal of his own firm, and 1986 formed the partnership of Tod Williams Billie Tsien Architects. The firm’s work has been repeatedly honored by The American Institute of Architects. In 1988 the firm received a National AIA Award for a dormitory at Princeton University, in 1989 for the Spiegel Pool House addition and in 1992 for two projects in New York City, the Quandt loft and the Go Silk Showroom. In 1997, the firm won a National Honor Award for the Neurosciences Institute and in 2001 they received two more, for a natatorium at the Cranbrook School and for a house on Long Island. In 2002 they were honored for the American Folk Art Museum, the first new museum built in New York City in over three decades. In the same year the museum also received the Arup World Architecture award for the Best Building in the World. Williams has held visiting professorships at a number of schools of architecture. He taught at the Cooper Union from 1974 to 1989. In 1995, Williams held The Ruth Carter Stevenson Chair at The University of Texas in Austin. He held the Eliel Saarinen Chair at the University of Michigan in 2002, and the Thomas Jefferson Chair in 2004 at the University of Virginia. In 1982, he received an Advanced Fellowship from the American Academy in Rome and in 1992 he was made a Fellow in the American Institute of Architects. The work of the firm has been published extensively both in the United States and overseas. A monograph entitled Work/ Life was released in the fall of 2000 by Monacelli Press.